As scores of wild species and ecosystems around the world face a variety of human-caused threats, from habitat destruction and fragmentation to rapid climate change, a new book published by the University of Chicago Press illuminates the growing significance zoos and aquariums play as conservation engines for the preservation of global biodiversity in this century. Titled "The Ark and Beyond: The Evolution of Zoo and Aquarium Conservation," the book, published in March 2018, includes a rich and diverse collection of authors including leaders from Shedd Aquarium and Phoenix Zoo, as well as from a host of other zoos and aquariums accredited by the Association of Zoos and Aquariums (AZA). They're joined by an equally impressive roster of university-based historians, biologists, ethicists, and social scientists, including scholars from Arizona State University, Cornell and Massachusetts Institute of Technology. Collectively, the authors trace the history of zoos and aquariums, their present role and future-forward evolution as conservation organizations. 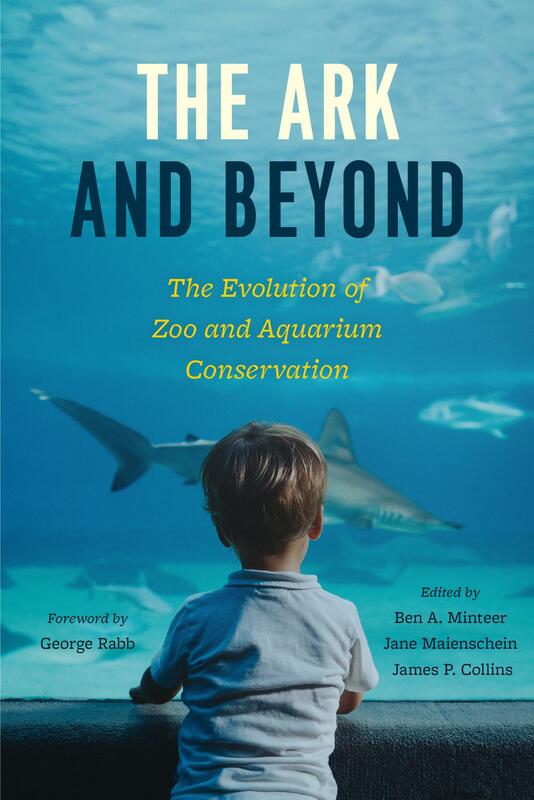 "Our goal with 'The Ark and Beyond' was to capture the very best thinking about zoo and aquarium conservation around today," said Ben Minteer, lead editor of the book and Arizona Zoological Society Endowed Chair at Arizona State University's School of Life Sciences. "It's a testament to the expertise and hard work of our contributors that the results exceeded even those high expectations." Featuring an inspiring foreword by the late George Rabb, president emeritus of the Chicago Zoological Society/Brookfield Zoo, "The Ark and Beyond" explores the whole range of research and conservation practices that spring from zoos and aquariums while emphasizing the historical, scientific and ethical traditions that shape these efforts. The book offers a framework for their future course, suggesting that if zoos and aquariums affirm biodiversity conservation as a top priority, these organizations will continue to play a vital role in tackling conservation challenges of global magnitude. One of the advance endorsements of the book comes from Elizabeth Kolbert, author of the Pulitzer Prize-winning "The Sixth Extinction: An Unnatural History." Kolbert shared, "In an age of extinction, 'wild' places are increasingly being managed like zoos. What role do actual zoos and aquariums have to play? 'The Ark and Beyond' looks at this question from all angles; the result is both informative and thought-provoking." Two opportunities to discuss the book's conclusions and hear from a handful of its authors will take place in Phoenix and Chicago this March and April, respectively. At the events, guests may purchase "The Ark and Beyond" and meet some of the authors for a short book signing. "Over the years, AZA-accredited zoos and aquariums have pioneered advances in research, fieldwork, and education, revolutionizing the way we approach wildlife conservation today," said Dan Ashe, president and CEO of the Association of Zoos and Aquariums. "I am pleased 'The Ark and Beyond' showcases some of the great work AZA members are undertaking to help save animals from extinction." Phoenix Zoo | Phoenix, Ariz. When: March 21, 2018 from 5:30 – 8 p.m.
RSVP: Email [email protected] by March 15. Details: For more information, visit Phoenix Zoo's website. Shedd Aquarium | Chicago, Ill. When: April 19, 2018, 5:30 – 8 p.m. Details: For more information, visit Shedd Aquarium's Facebook page. Books are available for purchase for $35 through the University of Chicago Press, Amazon, Barnes & Noble and the Changing Hands Bookstore (Tempe and Phoenix, Ariz.), with the proceeds benefiting the Arizona Center for Nature Conservation/Phoenix Zoo's conservation science and field conservation research programs.